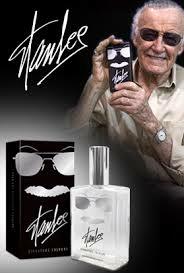 Inspired by the recent news that Stan the Man Lee has released his own branded cologne, I thought for a bit of fun it would be nice to come up with branded aftershaves for superhero characters. I’m slightly disappointed Stan Lee’s is not called Excelsior! and it has to have the exclamation mark afterwards because that’s how you say it. Anyway, about three months ago a similar conversation came up and I brainstormed some ideas with Gav from the Sidekickcast. So far we’ve got SNIKT for Wolverine. Thwip! for Spider-man. Armor for Tony Stark and possible three different ones for Captain America called Red, White and Blue. Still not 100% happy with the Cap ones. Had a few ideas for Thor on twitter, but none of them have really rocked me just yet. So, send in your ideas for other smellies. Subtle and clever wins….a firm handshake from me. Cos it was my idea, I’m the final judge. Ideas so far from Twitter…. You could do a simple ‘Stars and Stripes’ for Captain America, but perhaps too corny? And for Hulk… ‘Smash!’, or maybe just ‘Anger’.